Why Do I Need To Reapply Sunscreen Every 2 Hours? I hear ya. Reapplying sunscreen every two hours is cool at the beach, but do you need the hassle in your everyday life? Touching it up when you’re wearing a full face of makeup is something you’d rather NOT do – if you have the chance. Do you have the chance? Shouldn’t an application of sunscreen last for the whole day? You’ve probably heard that the SPF number determines the amount of time you can stay in the sun without burning. You calculate it by multiplying this length of time by the SPF number. Let’s say your skin burns after 20 minutes without sunscreen. If you’re using SPF 30, you can safely stay in the sun for 10 hours (30 x 20 minutes = 600 minutes). That’s almost the whole day! Why the heck do you need to reapply sunscreen at all? FYI, 10 hours in theory. Remember, SPF is measured by scientists using a lamp that emits a constant stream of UV light. In real life, UV rays are more intense during certain hours of the day. Even with the same SPF, you’d burn faster at noon than in the early morning. Remember the good old days when you could rely on math? 2+2=4 and all that jazz? Well, sunscreen math is not so straightforward – or reliable. Just because in theory SPF 30 should last you 10 hours, it doesn’t mean it will. Chances are, your sunscreen becomes useless way before day. Here’s the deal: as they neutralise UV rays, UV filters become ineffective. The more UV rays they absorbs, the faster their death. Dr Ellen Marmur better explains this in her book Simple Skin Beauty: “Chemical sunscreens don’t absorb the UV radiation as much as convert it into something benign (heat) that dissipates from the surface of your skin before it’s able to reach the collagen in the dermis and the DNA in your cells. Chemical filters intercept that radiation and transform it into something much less dangerous. At the beach, it usually takes around 2 hours to make your sunscreen completely useless. At the office? It’s impossible to tell. As a rule, the sunnier the day, the more often you need to reapply it. FYI, even though Dr Marmur is talking about chemical sunscreens, all sunscreens act this way. Technically, mineral UV filters (zinc oxide and titanium dioxide) are chemicals too. They break down as well, only more slowly. Related: Chemical Vs Physical Sunscreen: What’s The Difference And Which One Should You Use? Poor application: if you just apply a thin layer, it’ll get used up fast. Always apply the recommend amount to give your sunscreen the best chance to last as long as possible. That’s at least 1/4 of teaspoon for the face alone and a shot glass for the entire body. Swimming: no sunscreen is 100% waterproof. Some can last a little longer in the water, but you still need to apply them again once you get out. Sweating: if you’ve been working out at the gym, playing volleyball with your friends at the gym or just been sweating a lot (heck, some summer days are so hot, you’re sweating buckets even if you don’t move), the sunscreen will be melting away with the sweat. Reapply it often. Sunscreens don’t last forever. UV filters get used up while doing their job and wiped away when you’re swimming or sweating. Reapply yours as often as you can. Do you reapply sunscreen as often as you should? Share your thoughts in the comments below. Fifth Blog Anniversary Giveaway Winner! Monica, it’d be better to reapply on a normal day too, especially if you’re outside, or in front of windows, a lot. But, sadly, it’s so easy to forget, isn’t it? Paris, I agree. Reapplying sunscreen when you’re wearing makeup isn’t very easy to do. I think the easiest way to do that would be with a powder with SPF, but they provide very minimal protection so I’d recommend that only to those who spend most of their day indoors anyway. Indeed what about if you are at work the whole day, would you still need to reapply? I was always under the impression that when you are out the whole day in the sun re application is a must? 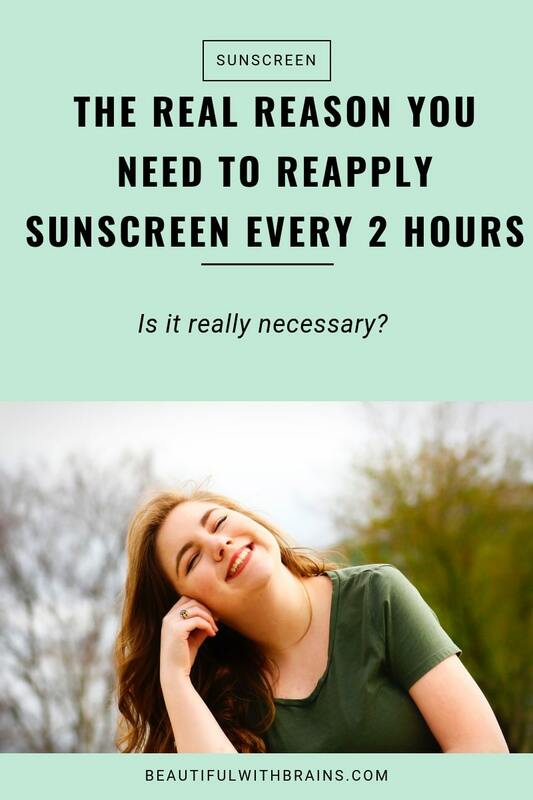 OH never mind I found your answer in this post: http://beautifulwithbrains.com/2011/03/08/is-it-really-necessary-to-reapply-sunscreen-every-2-or-3-hours/ love your blog! I would love it if sunscreens could really last all day. Though, I have to admit, I do use the right amounts. I slather it on pretty darn thick. Yay! PS: I prefer physical sunscreens for sure. Trisha, that would be wonderful! Who knows, maybe one day they’ll find a way to make it happen. In the meantime, I prefer physical sunscreens as they last a bit longer. So what about if I apply suncream spf 50 at morning, it only takes me 10-15 minutes to drive to work and during my working hours I don’t get any UV exposure because my workplace has no windows. I do not sweat or get wet during work. Is my morning sunblock application still protects me when I leave work after 8 hours? I apply physical suncream always. I feel it does, but maybe I am not careful enough…. Karola, yes, in the case you described, the sunscreen you applied in the morning should still be good enough by the evening. I wouldn’t reapply.